Tools for estimating greenhouse gas emissions. You can use these tools to help you identify and reduce your carbon emissions footprint. A very simple and interactive calculator from BP to estimate your "Carbon Footprint". It also provides quick, interactive ways to see how much you can reduce your Carbon output. The best and most flexible of the carbon calculators I have run across. Covers all the common fuels and all the common energy uses (transportation, heating, appliances, ...). Lots of other good renewable energy information on this site. 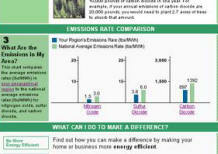 EPA power profiler provides CO2 and other emissions per KWH of electricity generation in your area. The eGrid database download provides tabular information that details emissions by location. A nice calculator to compare conventional cars to hybrids. Give gasoline savings, and green house gas emissions reduction. The energy that goes into the construction of a new home (or anything new) is called embodied energy. This can be a significant fraction of the total energy the home will use over its full life, so decisions on what kinds of materials and construction to use can be important if they differ significantly in embodied energy. Some sources that might help with these decisions listed below. Building for a long life helps to spread the embodied energy over a longer period of time. Extensive list of CO2 emissions for production of many materials and products... An extensive compilation of the CO2 emissions associated with making many common materials and products. Some information on embodied energy associated with common construction materials. And, the relative importance of operating energy. 2008 CO2 emissions report ... The Energy Information Administration publishes emissions and energy use data for the US each year. Quite a nice calculator that compares cost and emissions for flying or driving to your destination. Takes into account car, hotels, airport parking, ... pretty detailed. Compare traveling on the Queen Mary to a scooter to a train and many more.